RB-DMA2 Dual Digital Microphone Amplifier. The RB-DMA2 consists of two independent low-noise microphone pre-amplifiers for converting microphone level signals to a digital AES/EBU or S/PDIF output. 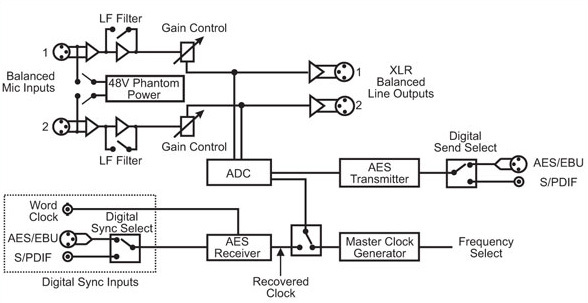 Individual analogue balanced line level outputs are also produced for use, for example, to feed talkback systems. The unit can either be used as two independent microphone amplifiers, or one mic input can be copied to both channels of the digital output. The microphone inputs are XLR-3 type and are electronically balanced. The input gain for each input can be adjusted individually by a volume control on the front panel enabling the use of dynamic and powered microphones and each has a LED level indicator. For each channel there are independent switches to control a high pass filter (low frequency roll-off at 125Hz) and to provide phantom power at +48V to the connected microphones. The RB-DMA2 has AES/EBU, S/PDIF and TTL word clock sync inputs and has the same sync modes, bit depth selection, channel status bit adjustment, front panel LED synchronisation and calibration routine as the RB-ADDA. Please refer to that product for further information.